East St. Market on Saturday morning. It's a proper London market in a narrow, inner-city street. The pavement's lined with stalls. The road's crowded with shoppers. And the air's full of traders' shouts and loud Gospel music. Fruit and veg. pot plants and second-hand clothing. Watches. Barbie dolls. Salt fish and biscuits. Fresh flowers, cow's feet and cheap electric razors. On each side of the street, behind the market stalls, are shops. Furniture, stationary, boots and shoes and luggage. Fishmongers, phone shops and bolts of cloth for curtains. There's dragon fruit, coconuts, popcorn and watermelon. Sacks of rice and spices and Chinese herbal remedies. ... but, hang on, Dave's isn't just a butcher's. It's more like a treasure-trove for nostalgic Irish emigrants. 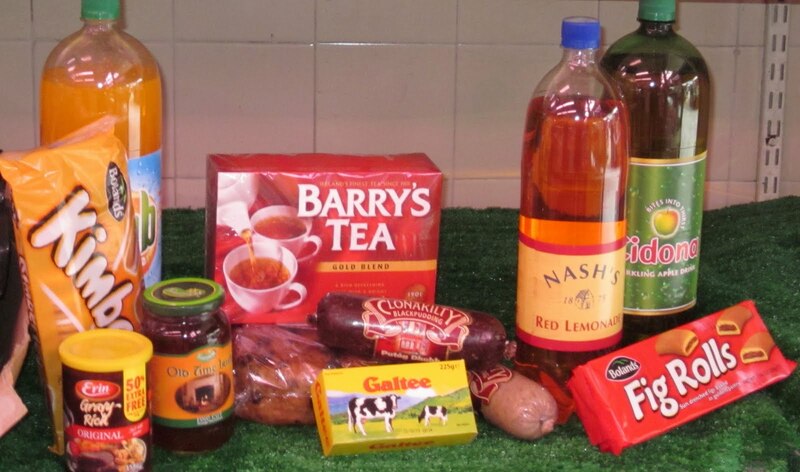 Remember Boland's Fig Rolls and Clonakilty Black Pudding? Galtee Cheese and Erin soups and Nash's Red Lemonade? Remember Old Time Irish Marmalade? And Silvermints? And real tea brack full of raisins, sultanas and mixed peel? Dave's got them. But of course he has. The Granny was from Cork. Maltana, a whole loaf. With a strong pot of tea. Zuleme, here. You can email me zuleme@gmail.com if you like, and we can remember Dublin in the 70's. Probably knew some of the same people! I'm also a writer, have a musical production this fall, a rewrite of one me and my partner did 13 years ago! Hi Felicity. I've enjoyed reading and am wondering if you would consider adding an RSS feed to your site? I'm not seeing any way to subscribe to the posts. Thanks for considering!